Department of Clinical Sciences, Faculty of Pharmacy, Philadelphia University, Amman, Jordan. ABSTRACT: Adenosine is a strong modulator of gene expression, which underpins some of its potential expected effects in skeletal muscle in terms of fatty acid metabolism. Accumulating evidence highlights a critical role for the adenosine system in the regulation of fatty acid metabolism and obesity. However, its molecular signaling role in fatty acid transport and oxidation in skeletal muscle is less clear. The aim of the present study was to examine whether acute and chronic treatment of skeletal muscle cells in vitro with stable adenosine analogue NECA, selective adenosine A2B receptors antagonist/inverse agonist PSB 603, and/or selective adenosine A2A receptors agonist CGS 21680 affects mRNA expression of key metabolic genes in skeletal muscle. 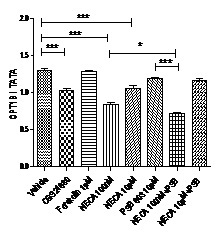 Rat L6 skeletal muscle cells were treated with NECA, PSB 603 and CGS 21680 for determination the mRNA expression of genes involved in fatty acid transport and oxidation (CPT1B, ACCβ and LCAD) using QRT-PCR (Probe-based). The results of the present study have shown for the first time that NECA alters the expression of a number of genes (CPT1B, ACCβ and LCAD). Moreover, this is the first study demonstrating that PSB 603 alters the expression of a number of genes (CPT1B, and ACCβ). To our knowledge, this is the first study demonstrating an alteration of CPT1B, and LCAD genes by CGS 21680. Adenosine A2B receptors mediate both NECA-induced LCAD, NECA-inhibited ACCβ, and NECA-modulated CPT1B mRNA gene expression in skeletal muscle cells. Collectively, these data reveal adenosine A2B receptors as a novel target to consider in our understanding of metabolic function in skeletal muscle and risk for the development of metabolic-based diseases. Carnitine palmitoyl transferase 1 beta: CPT1B: Acetyl-CoA carboxylase beta: ACCβ; Long-chain acyl-CoA de hydrogenase: LCAD; cAMP: Cyclic-adenosine monophosphate; cDNA: Complementary DNA; mRNA: messenger ribonucleic acid; PCR: Polymerase chain reaction; NECA: 5’-N-ethylcarboxamidoadenosine; PSB 603: 8-[4-[4-(4-chlorophenzyl) piperazide-1-sulfonyl)phenyl]]-1-propylxanthine; CGS 21680: 2-(4-[2-carboxyethyl]-phenethyl amino) adenosine-52 -Nethyluronamide; DMSO: Dimethyl sulphoxide; P-value: Probability. INTRODUCTION: Skeletal muscle has, due to its large mass, a central role to systemic energy homeostasis and whole body metabolism, being a major site for systemic lipid metabolism 1, 2. Indeed, skeletal muscle potentially plays a crucial role in metabolic diseases 3 as this tissue has an ability to oxidize fatty acid substrates and also has a high degree of metabolic activity 1. There are many signals that can regulate the ordinary and extra-ordinary functions of skeletal muscles and one such signal is the activation of adenosine receptors by the endogenous ligand adenosine. Adenosine is a ubiquitous homeostasis regulator. Adenosine is released from most tissues in the body and cells in culture. Extracellular adenosine may arise from intracellular adenosine or from breakdown of the adenine nucleotides, such as adenosine triphosphate (ATP), outside the cell 4. Adenosine is involved in the regulation of various processes such as lipolysis, cholesterol synthesis, fat deposition and lipid levels 5. Adenosine acts on cell surface receptors that are coupled to intracellular signaling cascades. There are four subtypes of adenosine receptors termed adenosine A1 , A2A, A2B and A3 receptors based on pharmacology and the adenylate cyclase systems 6. The adenosine A1 and A3 receptors inhibit the production cAMP through coupling to Gi. The adenosine A2A and A2B subtypes are coupled to Gs to stimulate adenylate cyclase. Furthermore, the adenosine A2B receptors, which has the lowest affinity (Ki > 1 μM) of all subtypes for native adenosine, is also coupled to Gq 7. Accumulating evidence highlights a critical role for the adenosine system in the regulation of fatty acid metabolism, and obesity 5. Plasma adenosine level was shown to be elevated in obese children 8. A key regulatory pathway in skeletal muscle that may be responsible for the modulation of muscle metabolism in response to adenosine is the adenosine A2B receptor signaling pathway 9, 10. Modulation of adenosine A2B receptors signal transduction via NECA/PSB 603 may allow for the mobilization and utilization of glucose and lipids as fuel by metabolically active tissues, including skeletal muscle. This important role in metabolic regulation has led to the suggestion that impaired adenosine A2B receptors function may be responsible for the metabolic abnormalities associated with obesity. The impaired response to adenosine A2B receptors stimulation in skeletal muscle tissue may have important implications for whole-body metabolism. Several groups have demonstrated that adenosine A2B receptors stimulation and/or cAMP signaling markedly and transiently activated the NR4A subgroup (subgroup of nuclear hormone receptors) in primary hepatocytes and liver, 3T3-L1 adipocyte, and skeletal muscle cells 10-13. The importance of adenosine A2B receptors signaling as a key modulator of metabolism has been identified at many biochemical levels including lipolysis in white adipose tissue 14. In this context, adenosine A2B receptors targeting in skeletal muscle cells may result in the modulation of critical genes controlling metabolism, coupled to changes in lipolysis, fatty acid transport and oxidation. This is suggestive of a potential role for the adenosine A2B receptors in the regulation of oxidative metabolism. The cellular mechanism(s) responsible for this modulation in skeletal muscle lipid oxidation is, however, not evident. It is then crucial to examine the specific effects of adenosine A2B receptors modulation on expression of lipid metabolic genes (Table 1). TABLE 1: GENETIC REGULATORS OF SKELETAL MUSCLE METABOLISM AND THE CONSEQUENCES OF OBESITY AND T2DM ON THEIR EXPRESSION AND FUNCTION. Materials: NECA, forskolin, PSB 603 and CGS21680 were obtained from Tocris Bioscience, UK; dimethyl sulphoxide reagent was sourced from Santa Cruz, USA; and Trizol and charcoal stripped serum were brought from Applied Biosystem, USA. Maxima Probe qPCR Master Mix (2X) and Thermo Scientific RevertAid First Strand cDNA Synthesis were obtained from Thermo Scientific Company, USA. RNeasy Mini Total RNA Purification kits and RNase-Free DNase Set were brought from Qiagen, Germany. Fetal bovine serum (FBS) was supplied by Capricorn Scientific, USA. Horse serum was from Sigma company, Germany. Ham-F 10 was sourced from PAA Company, USA. Dulbecco’s modified essential medium (DMEM) was from Caisson, USA. 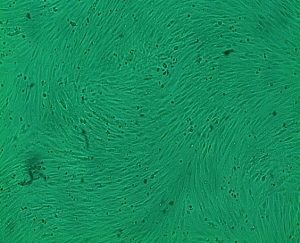 Cell Culture: Rat L6 skeletal muscle and myoblast cell line were originally obtained from the American Type Culture Collection (USA). Cells were maintained as an attached monolayer culture in DMEM with high glucose (4500 mg/L) and L-glutamate supplemented with 10% (v/v) heat-inactivated fetal bovine serum (FBS) and 100 μg/ml penicillin-streptomycin. Cells were incubated at 37 °C in a 90% humidified atmosphere of 5% CO2. The cells were passaged upon reaching a state of approximately 60%-70% confluency, and the medium was changed three times per week (Fig. 1). Confluent cells in 25 cm2 flasks were cultured for a further 14 days (to allow myotube formation), according to the protocol mentioned in 20 with slight modifications (Fig. 2). 70%-90% confluent myotubes (approximately 2 weeks in culture) were serum-starved (incubated in Ham-F 10 medium alone) for 19 hours or 7 days. Then, cells (Fig. 2) were treated for 1 hour with vehicle (0.1% DMSO), NECA 100nM and 10µM, PSB 603 100nM, 1 µM and 10 µM, Forskolin 100 nM, NECA and PSB 603 (cells were pre-treated with PSB 603 for 10 minutes prior to the addition of NECA). Following treatment, cells were washed with ice cold PBS, then lysed with TRIzol(Invitrogen product name) (2 mL per flask). FIG. 1: REPRESENTATIVE MYOBLASTS DERIVED FROM PASSAGE NUMBER 7. MYOBLASTS TAKEN AFTER 1 DAY SEEDING INTO 25 CM2 (10X). FIG. 2: REPRESENTATIVE MYOTUBES DERIVED FROM PASSAGE NUMBER 7 (AT 14 DAYS OF CELL CULTURE). RNA extraction and cDNA synthesis: Rat L6 skeletal muscle cells (in 25cm2 flasks) were scraped in 2 mL of ice cold TRIzol (Applied Biosystems, USA) and RNA was then isolated according to the manufacturer’s instructions. Total RNA clean-up and on-column DNAse digestion was performed using RNeasy purification columns (Qiagen, Germany). RNA concentration and purity was determined using a spectrophotometer (JENWAY Genova Nano). For cDNA synthesis, 500 ng of total RNA was reverse-transcribed using RevertAid First Strand cDNA Synthesis (Thermo Scientific, USA) in a total volume of 20 μL for 5 minutes at 25 °C, followed by 1 hour at 42 °C, and the reaction was terminated at 70 °C for 5 minutes. Taqman quantitative real-time PCR: The relative standard curve method based on Taqman quantitative real-time PCR (qRT-PCR) was used to quantify gene expression. Samples were prepared in a total reaction volume of 25 μL (13 μL Maxima Probe qPCR Master Mix 2X reagent, 1.5 μL forward primer (10 μM), 1.5 μL reverse primer (10 mM), 2.5 μL Probe (2 μM), 5 μL water, and 5 μLcDNA). The qRT-PCR analysis was performed using a 7500 real-time PCR system (Applied Biosystems, USA). Gene expression was determined relative to referenece gene, TATA. Primers and probes for all genes (Table 1) were designed using Primer Express software (Applied Biosystems, USA) and synthesised by Integrated DNA Technologies, Inc., USA. The standard curve method was used, with a slope between -3.2 and -3.6 and R2 values of more than 99%, indicating that amplification efficiency was nearly 100%. Data analysis: Data are expressed as means ± standard error of mean (SEM) of triplicate or quadruplicate wells generated from at least three independent experimental group. All mRNA data were analysed using one-way ANOVA with a Tukey test. Analysis was performed using GraphPad Prism, version 5.03 (GraphPad Software Inc). The level of statistical significance was set at p<0.05. 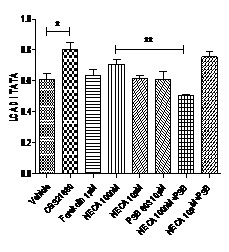 NECA modulates CPT1B, stimulates LCAD, inhibits ACCβ mRNA gene expression in skeletal muscle cells: To assess whether stimulation of adenosine A2 receptors could modulate CPT1B, ACCβ, and LCAD mRNA gene expression in rat L6 skeletal muscle cells, the effects of NECA were relatively quantified using a non-selective adenosine receptor agonist on above genes mRNA expression by qRT-PCR (probe-based). 19 hours or one week starved skeletal muscle cells were incubated with NECA (100 nM and/or 10 μM) for one, three and/or 24 hours, and mRNA gene expression of CPT1B, ACCβ, and LCAD were subsequently quantified. 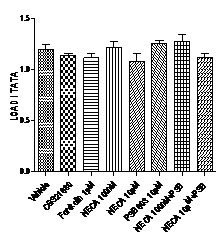 Incubation of one week starved L6 skeletal muscle cells with 10 μM of the non-selective adenosine analogue NECA increases mRNA gene expression of LCAD significantly (P<0.001) (around 1.3 fold change compared to vehicle), inhibits mRNA gene expression of CPT1B significantly (P<0.05) (around -0.76 fold change compared to vehicle), indicates that there is a downward trend in mRNA gene expression of ACCβ statistically significant (Fig. 4). Incubation of 19 hours starved L6 skeletal muscle cells for one hour with either 100 nM or 10 μM of the non-selective adenosine analogue NECA inhibits mRNA gene expression of CPT1B significantly (P<0.05) (around -0.64 and -0.85 fold change compared to vehicle, respectively), and does not change mRNA gene expression of LCAD. Moreover, incubation the 19 hours starved cells with NECA (10 μM but not 100 nM) for one hour decrease the mRNA gene expression level of ACCβ significantly (P<0.01) (around 0.57 fold change compared to vehicle) (Fig. 4). Incubation of 19 hours starved L6 skeletal muscle cells for 3 hours with either 100 nM or 10 μM of the non-selective adenosine analogue NECA does not change mRNA gene expression of CPT1B, ACCβ, and LCAD (Fig. 4). 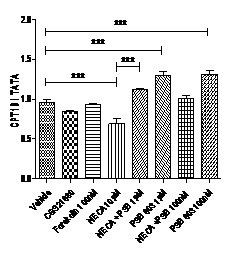 Incubation of 19 hours starved L6 skeletal muscle cells for 24 hours with either 100 nM or 10 μM of the non-selective adenosine analogue NECA increases significantly (P<0.05) (around 1.3 and 1.6 fold change, respectively) mRNA gene expression of CPT1B, decrease the mRNA gene expression level of ACCβ significantly (P<0.05 and P<0.01, respectively) (around 0.51 and 0.62 fold change compared to vehicle, respectively), and does not change mRNA gene expression of LCAD (Fig. 4). PSB 603 activates CPT1B and ACCβ, and does not change LCAD: Interestingly, incubation of one week starved L6 skeletal muscle cells with PSB 603 (100 nM and 1 μM) significantly increases mRNA gene expression of CPT1B (P<0.05) (around 1.4 fold change compared to vehicle) (Figure 4), and with PSB 603 (100 nM) significantly increases (P<0.001) (around 1.2 fold change compared to vehicle) mRNA gene expression of ACCβ. Moreover, incubation of one week starved L6 skeletal muscle cells with PSB 603 (1 μM) indicates that there is an upward trend in ACCβ mRNA gene expression (Fig. 4). Incubation of 19 hours starved L6 skeletal muscle cells for one hour with 10 μM of the selective adenosine antagonist/inverse agonist PSB 603 does not change mRNA gene expression of CPT1B, ACCβ, and LCAD (Fig. 4). Incubation of 19 hours starved L6 skeletal muscle cells for 3 hours with 10 μM of the selective adenosine antagonist PSB 603 does not change mRNA gene expression of CPT1B, ACCβ, and LCAD (Fig. 4). Incubation of 19 hours starved L6 skeletal muscle cells for 24 hours with 10 μM of PSB 603 mediates a significant increase in baseline of CPT1B mRNA gene expression levels (P<0.05) (around 1.7 fold change compared to vehicle) and mediates a significant decrease in baseline of ACCβ mRNA gene expression levels (P<0.05) (around -0.5 fold change compared to vehicle). 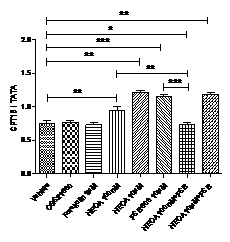 However, that does not change mRNA gene expression of LCAD in skeletal muscle cells at 24 hours incubation time (Fig. 4). Adenosine A2B receptors mediate both NECA-induced LCAD, NECA-inhibited ACCβ, and NECA-modulated CPT1B mRNA gene expression in skeletal muscle cells: To determine which subtype of adenosine A2 receptors mediate the modulation of CPT1B, ACCβ, and LCAD mRNA gene expression level, the adenosine receptor agonist CGS21680 (subtype A2A selective) was used. The concentration applied for CGS21680 could selectively activate the indicated subtype (Ki = 27 nM) 21. 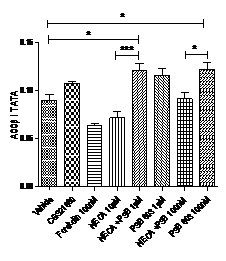 Incubation of the one week starved skeletal muscle cells with the adenosine A2A receptor selective agonist CGS21680 (100 nM) for one hour does not cause a significant change in the mRNA gene expression level of CPT1B, ACCβ, and LCAD in rat L6 skeletal muscle cells (Fig. 3). Incubation the 19 hours starved skeletal muscle cells with CGS21680 (100 nM) for one hour does not cause a significant change in the mRNA gene expression level of ACCβ, and LCAD in rat L6 skeletal muscle cells. However, CGS21680 (100 nM) decreases the mRNA gene expression level of CPT1B significantly (P<0.05) at the same incubation time (around -0.79 fold change compared to vehicle) (Fig. 4). Incubation the 19 hours starved skeletal muscle cells with CGS21680 (100 nM) for 3 hours does not cause a significant change in the mRNA gene expression level of CPT1B, ACCβ, and LCAD in rat L6 skeletal muscle cells (Fig. 4). Incubation the 19 hours starved skeletal muscle cells with CGS21680 (100 nM) for 24 hours does not cause a significant change in the mRNA gene expression level of CPT1B and ACCβ in rat L6 skeletal muscle cells. However, CGS21680 (100 nM) increases the mRNA gene expression level of LCAD significantly (P<0.001) (around 1.3 fold change compared to vehicle) at the same incubation time (Fig. 4). To investigate whether the effect of NECA is mediated by adenosine A2B receptors, a selective adenosine A2B receptor antagonist/inverse agonist, PSB 603 was incubated in skeletal muscle cells before 10 minutes of addition the NECA. The effect of NECA in one week starved cells on mRNA expression of CPT1B and LCAD is also significantly blocked by PSB 603 at a concentration equal to 1 μM and 100 nM, respectively (P<0.05) and reverses mRNA gene expression of ACCβ significantly (P<0.05) at a concentration equal to 1 μM (around 1.3 fold change NECA and PSB 603 compared to vehicle and 1.7 fold change NECA and PSB 603 compared to NECA) (Fig. 3). There is a significant different in the mRNA expression of CPT1B between either 100 nM NECA or 10 μM PSB 603 and (NECA and PSB 603 together) when incubating the 19 hours starved skeletal muscle cells with these ligands for one hour (P<0.001 and P<0.05, respectively) (around 1.2 fold change NECA compared to NECA+PSB 603 and 2 fold change PSB 603 compared to NECA+PSB 603) or 24 hours (P<0.01 and P<0.05, respectively) (1.3 fold change NECA compared to NECA+PSB 603 and 1.6 fold change PSB 603 compared to NECA+PSB 603) (Fig. 4). It is worth to indicate that CGS21680 (1 hour) has the same effect of 100 nM NECA. It is highly possible that adenosine A2A receptors are involved in regulation the mRNA expression of CPT1B (Fig. 4). The effect of the non-selective adenosine analogue NECA (100 nM) for one hour and 24 hours in 19 hours starved skeletal muscle cells on mRNA gene expression of CPT1B is significantly blocked by 10 μM PSB 603 (P<0.001 and 0.01, respectively) (Fig. 4). At the same time, incubation of 19 hours starved rat L6 skeletal muscle cells for one hour and 24 hours with 100 nM NECA and 10 μM PSB 603 (which was added to the cells 10 minutes prior to adding NECA) blocks the effect of PSB 603 for mRNA gene expression of CPT1B significantly (P<0.05) (Fig. 4). As shown in Fig. 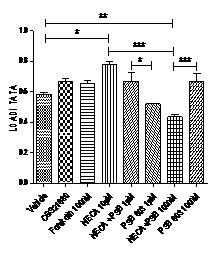 4, the effect of NECA (10 μM) in the 19 hours starved cells for one hour on the mRNA gene expression level of ACCβ is significantly blocked by PSB 603 (10 μM) (P<0.01). Interestingly, there is a significant different in the mRNA gene expression level of ACCβ between incubation that cells with PSB 603 (10 μM) alone compared with NECA (10 μM) and PSB 603 (10 μM). Moreover, incubation the 19 hours starved cells with NECA (100 nM or 10 μM) and PSB 603 10 μM for 24 hours decrease the mRNA gene expression level of ACCβ compared to vehicle significantly (P<0.05 and P<0.01, respectively) (Fig. 4). Regarding the LCAD, it was indicated previously in this study that incubation the 19 hours starved muscle cells with CGS21680 (100 nM) for 24 hours increases the mRNA gene expression level of LCAD significantly (P<0.001) (around 1.3 fold change compared to vehicle). Moreover, pretreatment of the same cells with 10 μM PSB 603 for 10 minutes prior the addition of 100 nM (but not 10 μM NECA) for 3 hours and 24 hours inhibited the effect of NECA significantly (P<0.05 and P<0.01, respectively) (around 1.4 and 1.5 fold change of NECA compared to NECA+PSB 603, respectively). As CGS21680 activates the mRNA expression of LCAD, and that effect of NECA (100 nM (but not 10 μM)) is blocked by PSB 603 (10 μM), it is highly possible in this situation that the chronic influence of NECA on LCAD gene expression might be also adenosine A2A receptor dependent, although further investigations are required to test this issue. Role of cAMP pathway in the expression of CPT1B, ACCβ, and LCAD mRNA gene expression: In previous studies, activation of adenosine A2B receptors in skeletal muscle by NECA increased cAMP accumulation 9, 22 and increased the mRNA gene expression of NR4A 10. In this current study, activation of adenosine A2B receptors in skeletal muscle by NECA modulates CPT1B, stimulates LCAD, and inhibits ACCβ mRNA gene expression in skeletal muscle cells. 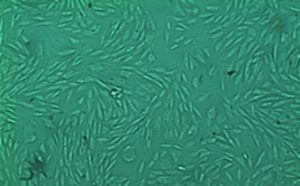 Experiments were conducted to investigate if the adenylyl cyclase pathway is involved in the activation of those genes transcription profile in skeletal muscle cells. For this purpose, the adenylyl cyclase activator Forskolin was used in the present study to understand the potential role of the cAMP pathway in NECA-induces LCAD mRNA gene expression, NECA-inhibits ACCβ mRNA gene expression and NECA-modulates CPT1B mRNA gene expression in skeletal muscle cells. Forskolin (100 nM)oes not cause any change in the expression of CPT1B, ACCβ, and LCAD. Incubation of 19 hours starved muscle cells with forskolin (1 μM) for 3 hours significantly up-regulates mRNA expression of CPT1B (P<0.05) (around 1.5 fold change compared to vehicle) and significantly down-regulates mRNA expression of ACCβ (P<0.01) (around -0.63 fold change compared to vehicle). However, there is no effect for NECA. Interesting, treatment the 19 hours skeletal muscle cells with forskolin (1 μM) for 1, 3 and 24 hours did not alter the mRNA expression of LCAD. FIG. 3: EFFECTS OF NECA, CGS21680, AND PSB 603 ON CARNITINE PALMITOYL TRANSFERASE 1 BETA (CPT1B) ACETYL-COA CARBOXYLASE BETA (ACCβ), AND LONG-CHAIN ACYL-COA DEHYDROGENASE (LCAD). Rat L6 skeletal muscle myotubes (70-90% confluent) were serum starved for 7 days and then stimulated for 1 hour. mRNA levels of those genes were measured relative to TATA-Box using real-time quantitative PCR (qRT-PCR); Stimulation was performed with vehicle (0.1% DMSO), NECA (10 μM), PSB 603 (100nM and 1 μM), CGS21680 (100 nM), and Forskolin (100 nM). mRNA relative expression of CPT1B (Figure 3-A), ACCβ (Figure 3-B), LCAD (Figure 3-C). Data were represented as means ± standard error of mean (SEM) of at least three independent experimental groups. * denotes p<0.05, ** denotes P<0.01 and *** denotes p<0.001. Data were analysed using a one-way ANOVA test followed by a Tukey test. FIG. 4: EFFECTS OF NECA, CGS21680 AND PSB603 ON CARNITINE PALMITOYL TRANSFERASE 1 BETA (CPT1B), ACETYL-COA CARBOXYLASE BETA (ACCβ), AND LONG-CHAIN ACYL-COA DEHYDROGENASE (LCAD (ACADL)) IN RAT L6 SKELETAL MUSCLE MYOTUBES USING CHARCOAL SERUM. Rat L6 skeletal muscle myotubes were stimulated for the indicated time from (1 hours (starvation 19 hours)) to 24 hours (starvation 19 hours) and mRNA levels of those genes, relative to TATA-Box, were measured by quantitative real time PCR (qRT-PCR); Stimulation was performed with vehicle (0.1% DMSO), NECA (100 nM and 10 µM), PSB603 (100nM, 1uM and 10 µM), CGS21680 (100 nM) and forskolin (100 nM). A) Stimulation was performed up to 1 hour. B) Stimulation was performed for up to 3 hours. C) Stimulation was performed for up to 24 hours. Data were represented as means ± standard error of mean (SEM) of three independent experimental group. (n=3; * denotes p<0.05, ** denotes P<0.01 and *** denotes p<0.001). Data were analyzed using one way ANOVA test followed by Tukey test. DISCUSSION: The results of the present study have shown for the first time that stable adenosine analogue alters the expression of genes involved in fatty acid transport and oxidation (CPT1B, ACCβ and LCAD). Moreover, this is the first study demonstrating that selective adenosine A2B receptor antagonist/inverse agonist, PSB 603 alters the expression of genes involved in fatty acid transport and oxidation (CPT1B and ACCβ). To our knowledge, this is the first study demonstrating an alteration of CPT1B, and LCAD genes by selective adenosine A2A receptors agonist, CGS 21680. In the present study, stable adenosine modulates metabolic gene expression levels in cultures of rat skeletal muscle over a period of one-several hours. This effect is apparently mediated by at least A2B receptor subtypes and involves the activation of genes encoding proteins well known for their role in the regulation of fatty acid transport and oxidation, and metabolism. The present pharmacological study is based on the use of a selective adenosine A2A receptor agonist, CGS 21680, and selective antagonist of adenosine A2B receptors, PSB 603. Hence, the lack of effect of CGS 21680 provides compelling evidence for the involvement of adenosine A2B receptors in the action of NECA. ACCβ is an enzyme that converts acetyl-CoA into malonyl-CoA. This metabolite is the major allosteric inhibitor of CPT1B. CPT1B is the major regulatory enzyme thought to be rate limiting for fatty acid transport through mitochondrial membrane, this leads to long-chain fatty acid oxidation within mitochondria 23. It has been shown that overexpression of CPT1B protects myotubes against lipid-induced insulin resistance 24. In this study, inhibition of CPT1B with the NECA may increase lipid deposition and consequently exacerbates insulin resistance. In addition, activation of CPT1B with PSB 603 may decrease lipid oxidation consequently improves insulin sensitivity. This might have an implication to enhance the fatty acid oxidation. On the other hand, increased mRNA ACCβ expression by PSB 603 might allow the cell to switch faster from fatty acid to glucose oxidation (through increase malonyl-CoA and consequently inhibition of CPT1B) without compromising the overall ability of the cell to oxidize fatty acids. Regarding the ACCβ, mRNA gene expression of ACCβ in diabetic skeletal muscle was up-regulated 17. In the current study, if the observed increase in the mRNA concentration of ACCβ in response to PSB 603 results in a higher protein content and activity, the formation of malonyl-CoA could be enhanced in the skeletal muscle. Consequently, this is supposed to inhibit the CPT1B mRNA expression in this study according to support the hypothesis of malonyl-CoA/CPT1B interaction 23. However, the data in the current study does not support the hypothesis of malonyl CoA/CPT1B interaction. The reason behind this might be that adenosine A2A appears to also modulate the mRNA expression of at least CPT1B, although further studies are required to investigate the exact signaling mechanism. 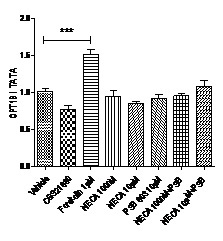 Short-term treatment of one week starved skeletal muscle cells with NECA (but not CGS21680) has been previously shown to decrease the expression of genes involved in fatty acid transport CPT1B in adenosine A2B receptors dependent manner, indicating that decreased fatty acid influx into muscle during exposure the cells to high concentration of NECA is accompanied by an adaptive decrease in gene expression. 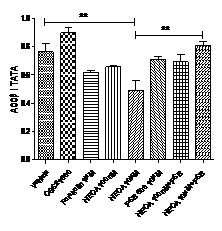 However, short-term treatment of 19 hours week starved skeletal muscle cells with NECA and CGS21680 has been previously shown to decrease the expression of genes involved in fatty acid transport CPT1B in adenosine A2A receptors dependent manner, indicating that decreased fatty acid influx into muscle during exposure the cells to high concentration of NECA is accompanied by an adaptive decrease in gene expression. The reason behind the difference effect in response to CGS 21680 in both cases (one week and 19 hours starved) is ascribed to differences in duration of starvation that might be implicated in differences in adenosine receptors subtype density/expression, although further studies are required to investigate this explanatory suggestion. On the other hand, chronic-term (24 hours) treatment of 19 hours starved skeletal muscle cells with NECA (but not CGS21680) increases the expression of genes involved in fatty acid transport CPT1B in adenosine A2B dependent manner. Taken together, adenosine system, in particular at least A2 receptors, are involved in transport of fatty acid transport into mitochondria. 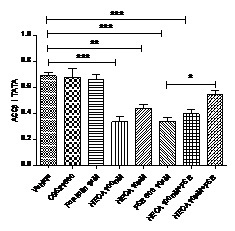 Short-term treatment of one week starved skeletal muscle cells with NECA (but not CGS21680) has been previously shown a decrease trend in the expression of genes involved in fatty acid oxidation ACCβ in adenosine A2B receptors dependent manner, indicating that decreased fatty acid influx into muscle during exposure the cells to high concentration of NECA is accompanied by an adaptive decrease in gene expression. 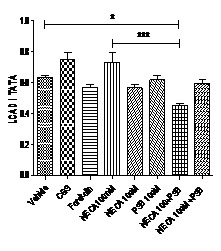 Moreover, short-term treatment of 19 hours week starved skeletal muscle cells with NECA has been previously shown to decrease the expression of genes involved in fatty acid oxidation ACCβ in adenosine A2B receptors dependent manner, indicating that decreased fatty acid influx into muscle during exposure the cells to high concentration of NECA is accompanied by an adaptive decrease in gene expression. The reason behind the different effect in response to CGS21680 in both cases (one week and 19 hours starved) is ascribed to differences in duration of starvation that might affect adenosine receptors subtype density/expression, although further studies are also required to examine this suggestion. Chronic-term (24 hours) treatment of 19 hours starved skeletal muscle cells with NECA (but not CGS21680) decrease the expression of genes involved in fatty acid oxidation ACCβ. Taken together, adenosine system, in particular at least A2B receptors, are involved in fatty acid oxidation. It is interesting to note that there is up-regulation in mRNA expression of CPT1B in response to NECA and PSB 603 (24 hours). However, at the same time, there is an opposite effect in mRNA expression of ACCβ in response NECA and PSB 603. Although a decrement in CPT1B can contribute to a reduction in lipid oxidation, the current data suggest that other facets of muscle lipid metabolism (such as LCAD and ACCβ) are altered in the mitochondria of skeletal muscle cells by NECA Carnitine palmitoyltransferase 1B (CPT1B, which catalyses the rate-limiting step in the transport of long-chain fatty acids into mitochondria) and long-chain acyl-CoA dehydrogenase (LCAD, which catalyses the first reaction in β-oxidation) are known transcriptional targets for both adenosine A2A and A2B receptors. 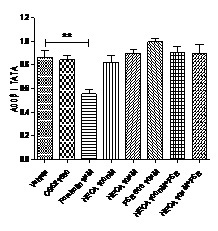 Short-term treatment of one week starved (but not 19 hours starved) skeletal muscle cells with NECA has been previously shown to increase the expression of genes involved in fatty acid β-oxidation LCAD in adenosine A2B receptors dependent manner, indicating that increased fatty acid β-oxidation during exposure the cells to high concentration of NECA is accompanied by an adaptive increase in gene expression. While chronic-term (24 hours) treatment of 19 hours starved skeletal muscle cells with CGS21680 increase the expression of genes involved in fatty acid β-oxidation LCAD, apparently in adenosine A2A receptors dependent manner. The implication of this is that both A2 receptors appear to be involved in fatty acid oxidation. Treatment the skeletal muscle cells by NECA inhibit the CPT1B mRNA expression in A2B dependent manner, consequently reduce the transport of fatty acid into mitochondria and presumably reduced beta-oxidation. However, treatment the same skeletal muscle cells by NECA activates the LCAD mRNA expression in adenosine A2B dependent manner, and consequently this enhances the long-chain beta-oxidation. At the same time, treatment the skeletal muscle by NECA inhibit the ACCβ mRNA expression in adenosine A2B receptors dependent manner, which unexpected does not support the ACCβ/CPT1B hypothesis. Taken together, adenosine system, in particular A2 receptors, play a role in modulation the fatty acid transport and beta-oxidation, although further activity studies are required to examine the exact mechanism. Even though cAMP elevation and NR4A mRNA expression was increased in skeletal muscle in response to NECA in adenosine A2B receptors dependent manner (not A2A receptors). Surprising, CGS 21680 selective adenosine A2A receptors activate the mRNA expression of specific metabolic genes (LCAD) and inhibit the mRNA expression of CPT1B. So, it is highly possible that at least both A2A receptors and adenosine A2B are involved also in modulation the gene expression of fatty acid metabolism (Randle cycle). At this point, we cannot rule out the functional presence of adenosine A2A receptor in skeletal muscle cells in terms of fatty acid transport and oxidation. Decreased fatty acid oxidation and transport results in peripheral insulin resistance 25, altered glucose flux for cellular oxidation 26, and ectopic lipid deposition in skeletal muscle when coupled with concomitant increase fatty acid availability 27, 28. Therefore, the current mRNA down-regulation in gene expression of metabolic genes (such as CPT1B) subsequent to acute treatment of skeletal muscle with stable adenosine analogue may support further modulations of skeletal muscle fatty acid metabolism. On the other hand, increased long fatty acid oxidation results in improved fatty acid oxidation. Therefore, the current mRNA up-regulation in gene expression of LCAD subsequent to acute treatment of skeletal muscle with stable adenosine analogue may support further improvements of skeletal muscle fatty acid metabolism. In general, the observation that adenosine A2B receptor blocker/inverse agonist up-regulated the expression of CPT1B and ACCβ, suggests that the capacity of skeletal muscle to oxidize fatty acid would be modulated by adenosine system, in particular adenosine A2 receptors. Generally, the difference in the effect of NECA or PSB 603 between the one week starved cells and 19 hours starved cells is due to duration of starvation that may play a role in gene expression modulation, including those metabolic genes 29. Moreover, it is possible that the density of adenosine A2B and A2A receptor or extracellular adenosine accumulation differ between one week and 19 hours starved cells. Experiments primarily carried out in the present study suggest that transcriptional regulation of a number of key genes involved in lipid metabolism is responsible for the metabolic adaptation in response to adenosine receptor ligands in skeletal muscle. It has been found that the mere addition of NECA and/or PSB 603 to the culture medium of rat skeletal muscle cells leads to a selective and coordinate induction of the expression of proteins involved in fatty acid transport and metabolism, thereby showing that adenosine A2 receptors ligands themselves are able to modulate metabolic gene expression in skeletal muscle. In summary, it has been observed in the current study, that the adenosine A2B receptor is accompanied by the expression of critical genes that regulated key aspects of lipid homeostasis in skeletal muscle. The non-selective adenosine receptors agonist, NECA also induced the expression of the NR4A family in skeletal muscle in adenosine A2B receptor dependent manner 10. This analysis suggested that Adenosine A2B receptors-mediated modulation of gene expression involved in lipid metabolism is concomitant with the induction of the NR4A subgroup in skeletal muscle tissue, although further studies are required to validate this issue. CONCLUSIONS: This current study has identified that adenosine A2B expression is an important regulator of multiple intracellular processes that may influence metabolic function in rat skeletal muscle. Adenosine A2B receptors agonists/antagonists eventually possess multiple beneficial actions including boosting skeletal muscle fatty acid metabolism possibly through modulating mRNA expression of metabolic genes. These findings significantly extend our understanding of adenosine A2B receptors physiology by considering mechanistic aspects outside of its classically known inflammatory role in skeletal muscle tissue. Therefore, further studies are invited to evaluate the clinical potential of adenosine A2B receptors agonists/antagonists in both animals and humans. It has been shown here that NECA treatment has profound effects on metabolic skeletal muscle cell gene expression, with a rapid response of key genes involved in nutrient oxidation and in other metabolic signaling pathways. Future experiments are critical to more clearly delineate the mechanisms by which adenosine A2B receptors influence the intracellular functions of skeletal muscle. Future studies will be necessary to examine the therapeutic potential of manipulating adenosine A2B receptors expression and/or function in skeletal muscle as a means to prevent the development of metabolic diseases such as obesity. ACKNOWLEDGEMENT: I would like to thank Abdul Hameed Shoman Foundation for supporting scientific research in Jordan and for their kind generous financial support of this project. Without this support, I could not perform this work. Indeed, this project was supported by grants from mainly Abdul Hameed Shoman Foundation (Grant number 12/2015) and Philadelphia University. DECLERATION OF INTEREST: The author has declared no conflict of interest. 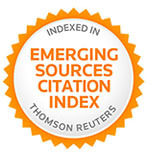 K. Baskin, B. R. Winders and E. N. Olson, Cell Metab 2015; 21 (2): 237-248. Cahova, H. Vavrinkova and L. Kazdova, Physiol Res 20087; 56 (1):1-15. Borowiec, K. Lechward, K. Tkacz-Stachowska and A. C. Skladanowski, Acta Biochim Pol 2006; 53 (2): 269-278. Antonioli, C. Blandizzi, B. Csoka, P. Pacher and G. Hasko, Nat Rev Endocrinol 2015; 11 (4): 228-241. B. Fredholm and K. A. Jacobson, Heterocycles 2009; 79 (1): 73-83. Ryzhov, A. E. Goldstein, I. Biaggioni and I. Feoktistov, Mol Pharmacol 2006; 70 (2): 727-735. Escudero, B. Carreno, N. Retamal, C. Celis, L. Castro, C. Aguayo, J. Acurio and C. Escudero, Biofactors 2012; 38 (6): 422-428. 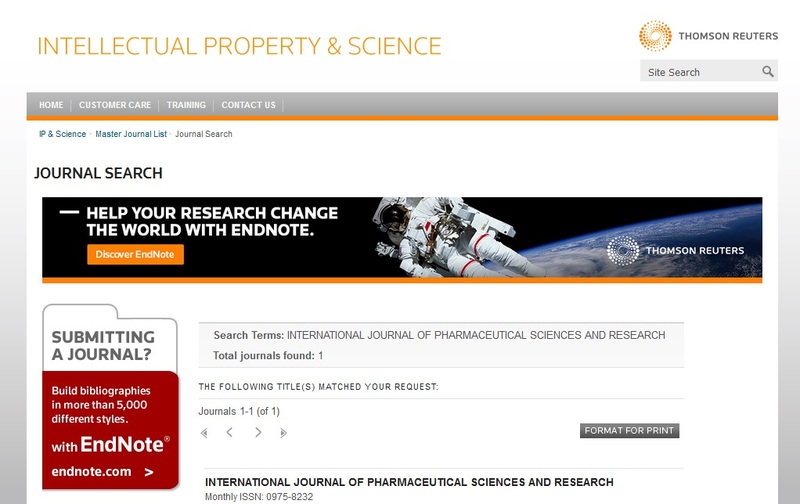 Haddad., Biomedical and Pharmacology Journal (BPJ) 2014; 7 (2): 383-398. Haddad., Biomedical and Pharmacology Journal (BPJ) 2016; 9 (1): 177-185. Pei, H. Waki, B. Vaitheesvaran, D. C. Wilpitz, I. J. Kurland and P. Tontonoz, Nat Med 2006; 12 (9): 1048-1055. A. Pearen, J. G. Ryall, M. A. Maxwell, N. Ohkura, G. S. Lynch and G. E. Muscat, Endocrinology 2006; 147 (11): 5217-5227. C. Chao, S. J. Bensinger, C. J. Villanueva, K. Wroblewski and P. Tontonoz, Mol Endocrinol 2008; 22 (12): 2596-2608. A. Figler, G. Wang, S. Srinivasan, D. Y. Jung, Z. Zhang, J. S. Pankow, K. Ravid, B. Fredholm, C. C. Hedrick, S. S. Rich, J. K. Kim, K. F. LaNoue and J. Linden, Diabetes 2011; 60 (2): 669-679. Y. Kim, R. C. Hickner, R. L. Cortright, G. L. Dohm and J. A. Houmard, Am J Physiol Endocrinol Metab 2000; 279 (5): E1039-1044. Kreuz, C. Schoelch, L. Thomas, W. Rist, J. F. Rippmann and H. Neubauer, Diabetes Metab Res Rev 2009; 25 (6): 577-586. Debard, M. Laville, V. Berbe, E. Loizon, C. Guillet, B. Morio-Liondore, Y. Boirie and H. Vidal, Diabetologia 2004; 47 (5): 917-925. F. Jheng, P. J. Tsai, S. M. Guo, L. H. Kuo, C. S. Chang, I. J. Su, C. R. Chang and Y. S. Tsai, Mol Cell Biol 2012; 32 (2): 309-319. Li, K. Higashida, T. Kawamura and M. Higuchi, Nutrients 2016; 8 (4). Haddad, J. Phys. Pharm. Adv 2013; 3 (12): 277-291. Ongini, S. Dionisotti, S. Gessi, E. Irenius and B. B. Fredholm, Naunyn Schmiedebergs Arch Pharmacol 1999; 359 (1): 7-10. Lynge, G. Schulte, N. Nordsborg, B. B. Fredholm and Y. Hellsten, Biochem Biophys Res Commun 2003; 307 (1): 180-187. Saggerson, Annu Rev Nutr 2008; 28, 253-272. R. Bruce, A. J. Hoy, N. Turner, M. J. Watt, T. L. Allen, K. Carpenter, G. J. Cooney, M. A. Febbraio and E. W. Kraegen, Diabetes 2009; 58 (3): 550-558. K. Montgomery and N. Turner, Endocr Connect 2015; 4 (1): R1-R15. R. Martins, R. T. Nachbar, R. Gorjao, M. A. Vinolo, W. T. Festuccia, R. H. Lambertucci, M. F. Cury-Boaventura, L. R. Silveira, R. Curi and S. M. Hirabara, Lipids Health Dis 2012; 11, 30. P. Corcoran, S. Lamon-Fava and R. A. Fielding, Am J Clin Nutr 2007; 85 (3): 662-677. Lara-Castro and W. T. Garvey, Endocrinol Metab Clin North Am 2008; 37 (4): 841-856. Tsintzas, K. Jewell, M. Kamran, D. Laithwaite, T. Boonsong, J. Littlewood, I. Macdonald and A. Bennett, J Physiol 2006; 575 (Pt 1), 291-303. Haddad M: The effect of NECA, CGS 21680, PSB 603 on fatty acid transport and oxidation in skeletal muscle cells. Int J Pharm Sci Res 2016; 7(12): 4827-38.doi: 10.13040/IJPSR.0975-8232.7(12). 4827-38.